The prime motif behind offering unemployment benefits is to provide workers, who are unemployed through no fault of their own, with monetary payments for a specific period of time or until the worker finds a new job. 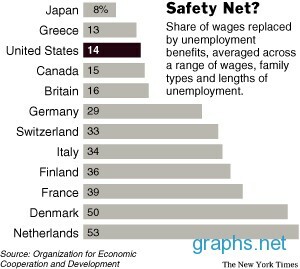 This report shows the percentages of wages of main benefits in different countries. If you find interesting, please consider sharing using the buttons on the left side of the graph.